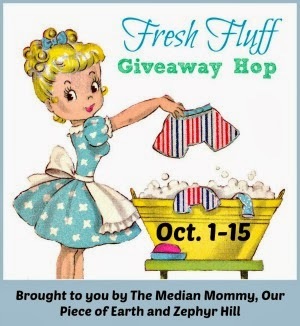 Welcome to the Fresh Fluff Cloth Diaper Laundry Giveaway Hop, hosted by The Median Mommy, Zephyr Hill and Our Piece of Earth. Over 30 blogs have teamed up to bring you some great cloth diaper+laundry giveaways in this hop! We’re offering you a little diaper laundry assistance with an amazing grand prize, valued at over $220! rays of bliss has teamed up with Rockin’ Green to offer you a chance to win Funk Rock Ammonia Bouncer for that really funky smellin’ fluff! Rockin’ Green offers many products that can help with your cloth diaper laundry! Rockin’ Green was developed by a real mom wanting a better option for her family, and Rockin’ Green has formulas developed specifically for cloth diaper laundry (like Funk Rock Ammonia Bouncer)! No wonder it is a favorite to so many Cloth Diaper Mamas! Win It! Enter to win Rockin’ Green Funk Rock Ammonia Bouncer ($14.95 value)! Come Back and Enter Daily to Win this Great Prize! Irresistibly Green – natural products for eco-conscious families, from cloth diapers to skin care and reusable snack bags. All orders over $20 ship free every day! Irresistibly Green is offering readers 10% off, now through 10/20/13, with the coupon code: MEDIAN10. 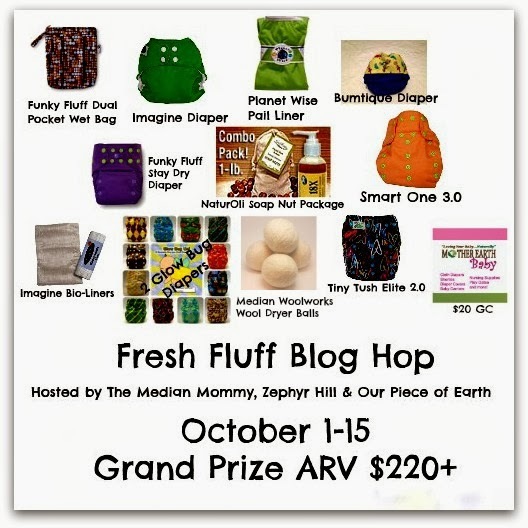 Be sure to visit the other blogs for your chance to win more great ways to keep your Fluff Fresh! This contest will run through October 15, 2013 at 11:59 pm CST. The winner will be chosen the following day and announced on rays of bliss. No purchase necessary. US entries only. Must be 18 years or older to win.The sponsors provided me with free samples of these products to review, and I was under no obligation to review them if I so chose. Nor was I under any obligation to write a positive review or sponsor a product giveaway in return for the free product. This promotion is in no way sponsored, endorsed or administered by, or associated with, Facebook. You understand that you are providing your information to rays of bliss and not to Facebook. Please note participating bloggers are not responsible for sponsors that do not fulfill their prizes. We have represented each sponsor with the expectation they will fulfill their prize and in a timely manner. We will contact the sponsor regarding your prize(s). The sponsors, in most cases, are shipping their items to you directly. I will make every effort to assist you obtaining your prize. If there is an issue with a sponsor, please notify the blog you won a prize from within 4-6 weeks for assistance, after that we may be unable to assist you. I have wanted to try rock in green for awhile and would love the chance! I would love to win because I want to try cloth diapering at night again and I think this would help with our ammonia issues! I love Rockin Green soap and it would be great to get a free bag to deal with cloth diaper funk! We’re rocking the solids now and have some Funky diapers from it. I’ve never tried it and people speak so highly of it. I’ll be CDing for the first time once my LO arrives. I’ve heard that Rockin Green is one of the best detergents to use to avoid stink, so I’m eager to give it a try. My sister has been wanting to try it so I would really like to win it for her. I hate ammonia smells and we have a constant battle at our house. I haven’t ever tried this but I would love to! Toddler pee is potent! with our stinky sulpherous well water we fight stink pretty often, this would be really useful! I really want the chance to try this because I’M on the lookout for a new detergent. I’d love to win because I’m almost out of our rockin green and need more! I love it!! I want this because every rockin green product is wonderful according to my friends. We will start cloth diapering next year. I love funk rock! I use it every couple of months to do a deep strip on my diapers. If I run out and can’t afford more, I often have to use bleach. Yuck! I would love to win, so I don’t have that problem. I am newer to cloth diapering and I have been having issues with different detergents as far as my daughter getting rashes, I have read so many great reviews about rockin green and would love to try out the product to see if it helps with the rash issue as well as to see how clean it makes my diapers 🙂 Trying new things in the cloth diapering world is so exciting! I am addicted! Sometimes we have some funky diapers, and it would be nice to be able to deal with them. I haven’t found a CD detergent yet that cleans well and doesn’t give my baby diaper rash. I’m a regular RnG hard rock user, but since my son has started eating solids his pee had gotten stronger and we are having issues with stinky microfiber and I could really use some funk rock. I want this because ive heard its an amazing detergent! I’ve been wanting to try this because it’s a safer detergent and I’ve heard good things. I’m generally skeptical of how well some green soaps will work so it’d be great to find an effective one. I use Rockin’ Green but have never tried the Funk. we’ve been using tide as we havent wanted to special order something for the c.d.s until we know it works for us. here’s our chance. I LOVE trying new to me products. If I like it, I may become a loyal customer! Rockin’ Green sounds like a great product to get rid of the odors in laundry. I have ammonia funk and need to get rid of it! I am still looking for a cloth diaper friendly detergent that wows me. I have tried Charlies and Bum Genius detergent and they’re ok but don’t always take the smell out. I have heard good things about rockin green so I would love to try it. We will be using cloth diapers with our first due to arrive in December. So having some Rockin Green would be great, especially since the local cloth diaper mamas around here say it works great with our hard well water. To have on hand for when I have funky diaper laundry! I’ve been using Tide but am thinking about switching over to the Rockin Green family… would love to try it out! I have never used rockin green before and would love to give it a try. Because I love Rockin Green! i want to win because i go through so much laundry detergent and this is one i haven’t tried yet. I thought we had the stinks under control after we switched away from microfiber, but my baby just proved me wrong… So would love to try this! To clean cloth diapers with! & to try it out! I’d like to try it on microfiber to see if it would be a good solution. They always seem to linger with smell. I would love to win so we can easily strip and deep clean our diapers! I need Rockin’ Green Funk Rock because my diapers are having some stink issues at the moment and I need that fixed stat!